A fantastic adventure awaits for those who can spare an extra handful of nights for this special region during their stay in Botswana. Meet up with our experienced Biologist guide on arrival and enjoy a talk on the geological history of the area over a lavish spread of tea and cakes; triple layer banana caramel cake, tangy lemon curd biscuits and the best brownies in the bush... Retire for the night at Jacks Camp, one of the most romantic camps on earth set in a picturesque clearing amidst acacia and palms, fashioned in classic 1940’s style creating an oasis of civilization. Early the morning, enjoy an sumptuous breakfast and depart on quad bike across Ntwetwe Pan in the Makgadikgadi on an extraodinary traverse on scorched white earth in your convoy, driving low-impact across this vast lunar expanse dotted with game, the shadows of swallows casting strange patterns and flocks of Ostrich imitating swerving topiaries of bay trees. Imprints of their fossils, long-ago exhausted from their flying fancies lay sketched on the earth pass, as do the foot prints of Elephant and bleached skeletal remainders of zebra from previous migrations. The journey breaks for a picnic lunch packed elegantly by the camp and laid out as a banquet on the what appears to be the surface of the moon. 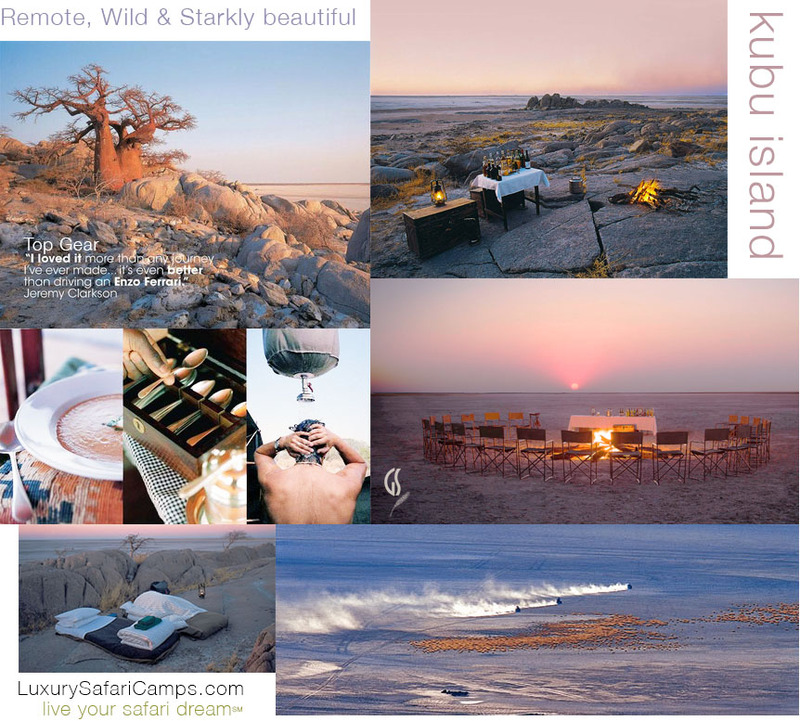 By sunset, an extrusion of granite shapes marks ‘X’ upon the face of Kubu island; One of the most graphically gorgeous locales in all of Botswana, studded with baobabs - trees that are fat, red ballet danseurs; bigger than buses, older than Christ. This place where the bushmen bartered beads for icy salt is also one of the most secretive, sacred sites. A place of power and ritual. You return from your wanderings of this territory before nightfall to find the staff have set up camp; steaming cauldrons of water suspended from the trees in private clearings offer a shower to wash the dust of the journey. 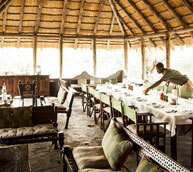 After a splash join your companions for a hot, camp-side dinner with silver service and fine wines to ease the spirit. Bedrolls snug and cozy with ticking comforters and hot-water bottles tucked within are spread across the high-ceilinged venue of five-gazillion stars to fold into bed with. The following day in this splendid location offers unsurpassed hiking for scenic vistas and seeking stone-age tools at the enormous Sowa (Sua) Pan, first described in the travel journals of David Livingstone. An extinct mouth of the Zambezi river lies here, scattered with spectacular water-worn pebbles and litters of garnets and cornelians, as well as the world’s largest breeding sites of greater and lesser flamingo. Kubu Island is a National Monument where archaeological recoveries have brought up prehistoric stone tools, dated sufficiently by experts to be older than the era of Homo sapiens. An eerie ancient defence fortification of a circular dry stone wall, scaling about 1.25 meters high is another compelling site. 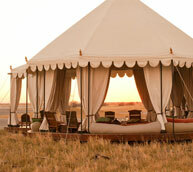 Kubu Island Rates - US $ 1,490 per person per night on a Guided Safari. Prices include accommodation, all meals and drinks, guided quadbiking safaris and applicable permits, reserve fees, scheduled game activities, VAT & applicable government levies. Flights from Maun can be arranged with Guided Safaris® packages. Ask about our travel insurance options for USA residents. 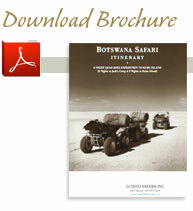 Custom itineraries through Botswana available. 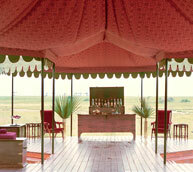 *Open to direct Guided Safaris® travel guests only, no agent queries and third parties please. Quadbike and canoe your way through our adventure portfolio with Jack’s Camp, San Camp and the beautiful tented Zarafa Camp for a real big game safari to complement your classic desert experience. Our professional guides take you through some wild and beautiful locations in Botswana with our award-winning luxury camps, scattered from the Okavango Delta to Selinda concession in the north.